Middle School: The Worst Years of My Life hit theatres last weekend. 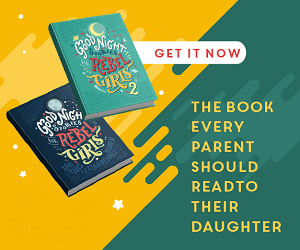 Based off of Middle School: The Worst Years of My Life, the first in the Middle School series by James Patterson, the film is aimed at, well, middle schoolers or tweens. The bad guy of the film is a rule obsessed principal whose entire goal seems to be to squash all creativity out of his school’s pupils. The film’s hero, Rafe Khatchadorian, sets out to break every rule in the book via a series of elaborate pranks, which include, among other things, covering every inch of the principal’s office in stickie notes. My kids are a little younger than the intended audience, but they still giggled at the trailer. Stickies feature prominently in the film, so as part of the promotion surrounding the big launch Entertainment One sent my family a box of Stickies and a mission to see what sort of creative Stickies art project my kids could come up. 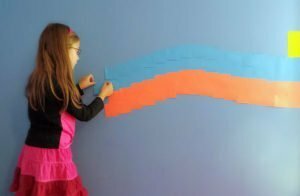 My nine year old daughter, whose online nickname is Rainbow, has been asking me for a while now for permission to make a rainbow on her bedroom wall. This seemed like the perfect chance to make some giant wall art, without making a giant mess. We both loved the one line from the trailer, “Whoever did this is commited to their art.”, which she later repeated to me with a giggle as we worked together to deface her bedroom wall with Stickies. The one surprise I had while making our Stickies artwork was how long it took. We ended up spending about two hours on our pixelated mural. This would be a great Saturday afternoon or rainy day art project. Just get a pile of Stickies and let the kids go wild. Rainbow wants to add more to it, and has big plans for a sticky note butterfly, and some sort of school calendar. Again, I love that I can hand her over a pile of Stickies and let her get creative, without any worries about her permanently marking up her bedroom walls. What about you folks? Have you ever made art out of sticky notes? Any fans of the James Patterson Middle School books out there? Do you have plans to take your kids to go see Middle School: The Worst Years of Our Life? Disclosure: This post was sponsored by Entertainment One. As always my words and opinions are my own. Love this…no mess, no damage and very creative. Good job Rainbow! The movie trailer looks over the top and lots of fun. 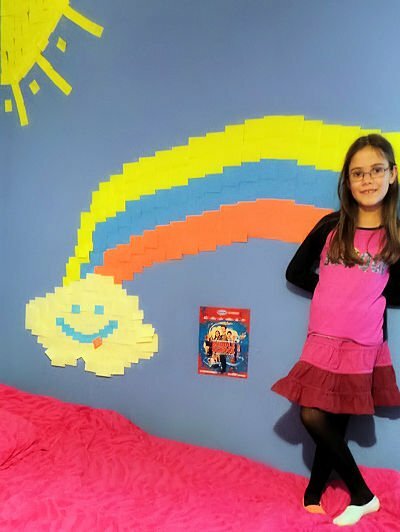 Artwork with stickies sounds like an activity most kids would love. 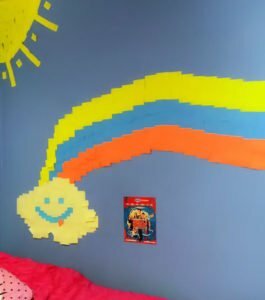 My boy loved making things with sticky notes! still does, and so does his dad lol. My daughter just started Middle School…which were years I hated!